Using permafrost as a foundation and accounting for permafrost in the environment that may cause slope instability hazards are only part of the challenge when constructing in mountainous environments. There are many additional ones that need timely planning. The remote location of the construction is demanding on the logistics. Electricity and water may not be available and may have to be supplied to the site. Accommodation and food has to be planned for the site, and the effects of altitude on workers and machinery must be taken into consideration. Severe weather conditions often shorten the construction season and simply slow down any construction activity. Cold temperatures are tough on machinery and increased abrasion and wear must be considered. These facts are often not accounted for enough but rapidly cause increasing construction costs. Steep terrain and rugged conditions also limit access options. Special transport cable-cars are often installed just for the duration of the construction period. Access by air might be the only way to get to the construction site, which limits the weight of the equipment that can be used, is highly weather dependent, and very costly. When road access is possible, permafrost conditions are to be investigated since they might also limit access of heavy machinery in particular during summer months. Due to surface mass movements, e.g. solifluction, access roads might only be accessible for a limited time or have to be regarded regularly (Fig. 15). Figure 15. 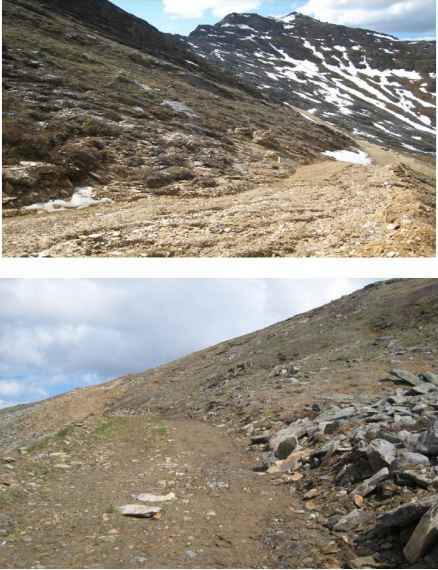 Solifluction on temporary access road in the Brooks Range, Alaska (D. Kinakin). 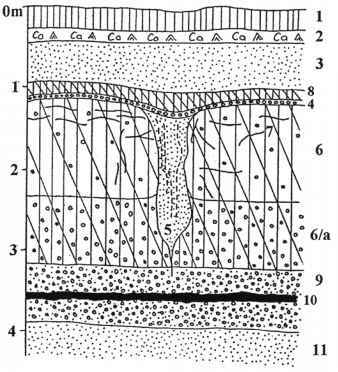 One problematic aspect of construction in permafrost is the introduction of concrete or grout into the ground and the resulting hydration heat given off during the curing process, which lasts at least a month. The hydration heat of 1 m3 of concrete is between 65,000 and 162,600 kJ (e.g. PCA, 1997), depending on the cement content, compared to the 333 kJ required to melt 1 kg of ice. Hence, the heat produced during the curing of 1 m3 of concrete can melt large quantities of permafrost ice. When smaller amounts of concrete or grout are involved, e.g. for micropiles, subzero ground temperatures can cause it to freeze before attaining the appropriate bearing capacity, implying that anti-freeze additives or so called 'retarders' are required to ensure that the curing process can be achieved successfully (Moser, 1999). The Swiss guidelines for the construction of avalanche defence structures also stipulate that warm water be used for the grout mixture injected into anchor boreholes in order to delay freezing (Margreth, 2007; Thalparpan, 2000). Whereas both anti-freeze additives and warm water have positive effects on the final bearing capacity of the grout and anchors, they will disturb the thermal regime of the permafrost. These aspects must therefore be considered carefully in terms of the effect on the ice content and long term stability of the ground. o Blasting adaptations: Due to the monolithic nature of frozen ground, more explosives are needed in frozen soils with ice. o Special machinery: The frozen nature of the soil requires special equipment for excavation that is usually heavy. o Protection of excavation: Changes in the soil strength due to thaw in excavation slopes must be considered, in particular if the excavated frozen slope is exposed to the warm summer temperatures. Fleeces for thermal insulation and optimising trench angles may be considered.